Many women treat themselves to a manicure at least every couple of weeks, and some more often. 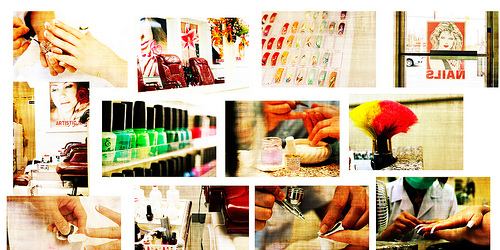 The nail salon business is a booming one that is ever-expanding around the country. If you are a licensed nail tech, or just an entrepreneur who is looking for a smoking hot business to get started with, then starting a nail salon business may be right for you. A well-groomed set of nails is on the savvy woman’s checklist, and just like visiting the hair salon regularly, you will find that many women are very stern about seeing their manicurist just as often. Keep in mind that it is required by the board of health in most areas that a nail tech be licensed and certified by the state, so if you don’t have that certification then you will need to hire a nail technician to work for you. You will also need a business license or occupational license, and other permits that may be required by your state or city. Before opening your business, you will want to get an idea of the scope of your nail salon business. What services will you offer your customers and clients? Will you provide basic manicures and pedicures, fiberglass and gel nails, acrylic nails, and airbrushed nails? Offering a full service salon will allow you to appeal to the widest number of customers in your niche – which includes women of all ages and some men. Yes, men like to be pampered and well-groomed too, so be open to that growing concept. Opening a salon is not an endeavor that can be undertaken on a meager budget. You will need to rent or lease a commercial property, and ideally it will be located in a busy shopping center or downtown area where you can get a lot of walk-in customers. Many people who start take out a small business loan to become operational. The size of commercial building you need will be based on the size of the business you want to establish. Will you offer more than a couple of manicure stations? How big do you want your waiting area and reception area to be? Allow enough room on either side of your manicure stations for folks to maneuver around easily. When a person is getting a manicure, they want to be in a relaxed environment, not a tiny, cramped up space. Also make sure that there is adequate ventilation in the building as the chemicals used in manicures and pedicures can be quite unappealing or even harmful to breathe in. Other than renting (or perhaps even buying) the building you will use, you will also need money for the manicure stations, manicure supplies, furnishings and furniture for the waiting and reception area, and for any remodeling you wish to do (like installing new carpeting and etc.). Oftentimes a building owner will agree to put in new carpet to your preference or do some painting in order to entice you to sign a lease with them – so be sure to ask! Once your nail salon business is set up, you’re ready to hire your nail techs and get to work! Be sure to launch a website along with the opening of your new business so that you can draw more exposure to your business. Today’s clients expect that you’ll have a web presence so that they can schedule appointments online or get more information about the services you offer. Build your brand and get noticed with a professional logo design. Joseph has been helping small businesses build their brands and raise awareness by designing business logo concepts for new start ups on a budget.